Czech Center New York started a project entitled “Prague-New York Effects” two years ago. It’s a transatlantic cultural program that sees an artist from Prague collaborating with an Artist from New York. The artists meet in NYC for a residency that culminates in a performance. The team then travel to Prague to perform there. This is the 7th performance in the series and blends three styles of stand up comedy from ironic storytelling to clown humor to improvisational stand up. For this production there are two artists from Prague (Miřenka Čechová and Robert Janč) and one New Yorker (Quentin Heggs). I chatted with Mirenka and Robert about their upcoming performance. Where do you get your inspiration from for your particular brand of storytelling? Mirenka: I am always writing about my personal experience, especially about things which are difficult for me and which I need to reconcile with through distance or humor. 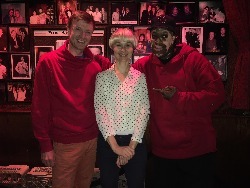 As well the Prague-New York Effects are about creative meetings between Czech and American artists so I am really happy to have a chance to collaborate with Quentin Heggs, the American stand up comedian, who is for me and Robert, a huge inspiration. Robert: I get inspiration from my life. Its actually one of the basic guidelines in the books and stories I\\\’ve been reading about stand up. And the stay here in NYC will definitely have its impact as well. What can we expect from your performance on Friday in terms of themes you are tackling? Mirenka: My character Mckenzie Tomski comes from the upcoming book that melts narratives written by me and photography by Brooklyn based photographer Marie Tomanova. Mckenzie is an immigrant artist living in NYC trying to succeed in her own way in this beautiful and as well challenging city. It is an ironic gaze on a struggle that many immigrants and unprivileged are facing every day. But there is still the amazement, desire and hope that gives them their everyday power. On Friday I will stage three stories from the book adapted for this evening. Robert: For me the Friday experience is going to be the real life experience of how a person doing stand up comedy feels on stage. That is one of the main topics for me. In any other stage form I have experienced you have something to “cover yourself with” – costume, character, mask, set, props, your partner. In stand up its just about you and you alone. Mirenka: Robert and I are actually schoolmates from the Academy of Performing Arts in Prague. I remember meeting Robert for the first time in the hall, at the time when he was still part of this crazy avant-guard Russian theater company, where everyone had to be shaved and I said myself: wow! He walks like a ghost and talks like a monk, hmmm… such an interesting personality! Robert: We met as schoolmates at the Nonverbal Theatre Academy and again a few years later during which I\\\’d been working as a lighting technician, Mirenka invited me to replace someone in her show. Since then we have been in touch, working together. Mirenka is a very special person to me. She has been around and in the centre of some of the most important events of my career. Each of your short performances on Friday are “extracts” from your individual shows. Can you tell me a bit about the shows you are creating outside of Prague New York Effects? Mirenka: My show will be titled Miss AmeriKa, which is the same title as the book, and it will be a one woman show, with projection of photography by Marie and sound design by Martin Tvrdý. It will meld storytelling, physical theater, dance and music and each performance will be slightly different because the audience will be curating the choice of stories performed each night. Robert: My background is clowning – and most probably the meaning will be different for you than for me. Nevertheless, clowning for me means a state of being when you are ready and open for anything. I am exploring a situation when a clown happens to be on stage because the main star did not show up. Through this character, I am trying to look at stand up as a phenomenon, its rules and challenges, revealing that anybody\\\’s life is worth talking about and its actually full of material that could be used in stand up comedy. Who are your favorite comedians/storytellers and why? Mirenka: I came from a dance background so there is a wide range of favorite artists not only comedian and storytellers that I like. I always want to watch female storytellers, stand up comedians and actresses with strong physical presence on stage and something what we Czechs call: “the balls” – you can imagine what I am talking about. Someone who is brave enough to go on the stage alone and to be vulnerable, truthful and personal. Because art should be personal. Robert: Anybody who is really who they are. I love Jim Carrey for his incredible physicality. I love many of my clown doctor colleagues for being incredibly stupid and funny. I love Quentin for his never ending presence and ability to turn any word into a joke. My clown mentor Gary Edwards is like that as well. For Mirenka and Robert: What about NYC fills your creative well? Mirenka: Ohhh…this city itself when you don\\\’t need to make your living in it, then it is like an explosive bomb full of ideas, energy, drive and power. When you live here, then it is like a special life training at survival camp. I love both. Both of those experiences brought the most remembered moments, changes and growth and I finally became an adult here! Love the city! Robert: This is such an intensive time. Of course it is the overall atmosphere of the city which is simply alive. Its not easy for a Central European guy to catch up with the speed but I am being incredibly inspired. By Quentin in the first place, by his modesty, his openness and his ever present ability to make jokes is amazing. He is such an inspiration, but it can’t be copied because it’s his personality. So I need to rely on mine. Prague-New York Effects #7 takes place at The Bohemian National Hall on Friday 17 November, 9:30 PM. © Copyright 2017 by Jeff Myhre, PhD, Editor. No part of this publication may be reproduced without written consent. Produced using Ubuntu Linux.